12:02 PM Hair Lice, Health, Home Remedies., How to, Treatment. Being infected with Lice can be a big problem. The constant itching on the head is enough to drive anyone crazy. There are many over-the-counter treatments available for treating lice. But the lice can return. For this reason it is important to get rid of the lice and their eggs completely. Lice are a result of poor hygiene habits. They breed quickly on the scalp that is dirty with oil and grime. It is important to keep the scalp and hair clean in order to prevent lice in the hair. Natural treatments are the best way to treat lice. Using home products will kill the lice and their eggs. Indian lilac also known as ‘neem’ is the best remedy for eliminating g lice and their eggs. The leaves of the tree of Indian lilac are bitter in taste and have antifungal and antibacterial properties due to which lice are effectively removed. Make a paste of leaves of Indian lilac by grinding them in an electric mixer with a little water. Apply the resulting paste all over the scalp and the hair. Leave the paste on the hair for 30 minutes. Remove the paste using only water. You can also make an infusion of neem leaves. Boil a liter of water and add handful of neem leaves in the water. Allow the leaves to steep in the water for 20 minutes. Strain the water and throw away the leaves. Use the water for cleaning your hair. Use paste of Indian lilac every day on your hair until the lice is completely gone. Continue using the paste once a week for a period of one month to ensure the lice do not return. Tea tree essential oil has antifungal and antibacterial properties that kill the lice and their eggs. Make a solution of tea tree essential oil by diluting four tablespoons of the oil with one cup of water. Take cotton wool and dip it in the solution. Apply the solution on your scalp and hair using the cotton ball. Let the solution dry completely before combing your hair. Wash hair 12 hours after application of tea tree essential oil solution. Apply tea tree oil solution every day on your hair for three days. This will completely get rid of the lice and also kill their eggs. Combine one cup white vinegar with half cup warm olive oil. Spread the mixture all over your scalp and hair. Leave the mixture on the head for 30 minutes. White vinegar is effective for treating fungal and bacterial infections. It also cleans the scalp of dirt and accumulated sebum. Cleaning the scalp gets rid of the food, like dead skin cells, that the lice feed on. Wash hair with mild shampoo and water. Do this treatment every day in the morning to keep your skin clean and itch-free through the day. Using this treatment for a week will rid your hair of lice. Lemon has acidic properties that are useful in killing the lice and their eggs. Lemon also removes the dirt, grime, dead skin cells and sebum from the scalp keeping it clean and fresh. Take a ripe lemon and cut it into two halves. De-seed the lemon. Make partitions in your hair and squeeze lemon over the scalp. Massage the scalp using lemon wedges. The lemon juice might sting the skin of your scalp but the sting will go away after some time. Leave the lemon juice on the scalp and hair for 20 minutes and then wash hair using warm water. Do this treatment every day for a period of one week. Not only will you be rid of lice, but the dandruff on your hair will also be cured. Make a paste of boric acid powder by combining half cup boric acid powder with one cup water. Apply the paste on your scalp and hair. Take care to cover the entire area of your scalp with boric acid paste. Leave the paste on the hair for 30-35 minutes. Wash with lukewarm water and mild shampoo. 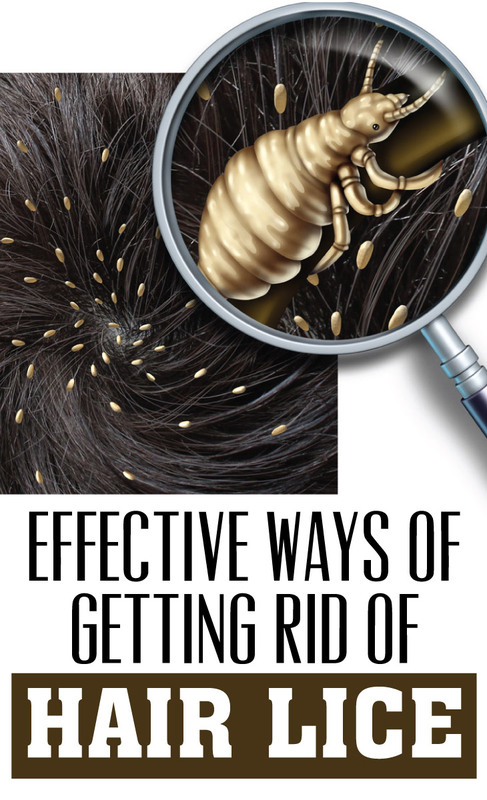 This treatment can be done twice a day to fasten the removal of lice and their eggs. Apply warm coconut oil on your hair and scalp. De-tangle your hair using a wide-tooth comb. Now take a narrow-toothed comb and start combing your hair beginning from the roots and moving to the tips. Take care to cover the entire area of scalp and all the hair. Check the comb for lice and their eggs. Keep killing the lice and their eggs by dipping the comb in a solution of antiseptic liquid continuously. Check for any fallen lice on your clothes and the place you are sitting. It is important to kill the lice and their eggs in order to avoid re-infection. The comb treatment can be done twice or thrice a day to get rid of the lice. However, do not use the comb on dry hair or you will hurt your scalp. Never scratch your scalp as it can cause cuts in the skin. The lice and their eggs can enter the blood stream by entering these cuts. This can lead to serious infection requiring immediate medical attention. Always keep the scalp clean by washing hair and scalp every alternate day with clean water and mild shampoo. Avoid sharing towel, clothes, pillow covers and bed sheets with other people. Soak your clothes and linen in hot water for 30 minutes prior to washing them. Hot water is very effective in killing lice and their eggs. Wash all the clothes and linen with a strong detergent and warm water. Treat the entire household for lice even if one person acquires it. Lice spread very fast and easily. Chances are that by the end of the day everybody in the house (including pets) will be infested with lice and their eggs.